Creek &amp; Huge Mountain Views! Power to lot! This property could work for retirement or relocation, or just for a nice vacation cabin. Bring the horses- fenced on two sides! This is a great area to set up your own place in the west with huge mountain views for your backdrop, a small creek with some willows and cottonwood trees. It is 60 miles southwest of Billings (pop 100,000) and about 45 miles north of Cody, Wyoming (pop 10,000). Property comes with easement for access to a 4 acre pond that has fish in it. Small creek flows year-round (Grove Creek), but too small for fish. Call today to get a complete pdf packet emailed to you. 20 ACRES IN MONTANA WITH A YEAR-ROUND CREEK--- CORNERS ON 1000's of acres of public land! Power and phone on site! Easement to 4 acre pond on Grove Creek for recreation-- PONE 100 FEET TO THE WEST!! 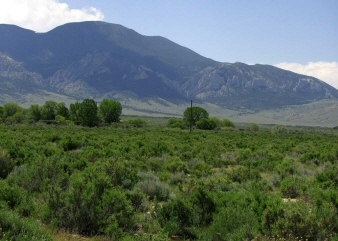 To the east you have views of the Clark's Fork of the Yellowtone River Valley and the Pryor Mountains. To the west the Beartooth Mountains loom 6000 feet over you jutting upward with impressive limestone spires and cliffs. The National Forest is 5 miles to the west and you could ride your horses there on the public land that would stretch from just across the county road all the way there!! I have seen mule deer, whitetail deer, elk and antelope around this property, as well as pheasants, sharptail grouse, Hungarian Partridge and sage grouse. Plenty of wildlife and lots of public land for hunting. You are only 5 miles from the pavement so access is great. You would be 10 miles from the community of Belfry (pop 200) and 25 miles from Red Lodge (pop 2500) where you will find a great ski area and the gateway to the Beartooth Highway that can take you all the way to Yellowstone National Park!